With food like Fried Chicken Marinated in Sage, Rosemary, and Garlic, and some of Italys most gorgeous countryside, its little wonder Umbria is becoming such a popular tourist destination. Home to beautiful hill towns such as Deruta, Perugia, and Assisi, plus a culinary history that dates back to the Etruscans (Italys oldest and perhaps most fascinating civilization), Umbria rejoices in hearty dishes rooted in vegetables, legumes, grains, and farm-raised meats and redolent of herbs and bold sauces. Acclaimed cookbook author Julia della Croce takes us on a stunning visual and gastronomic tour with recipes for dishes such as Penci with Sausage, Lemon, and Nutmeg Sauce and Lorella Puccettis Lentils with Seafood, which perfectly illustrate Umbrias simple, everyday style of cooking. 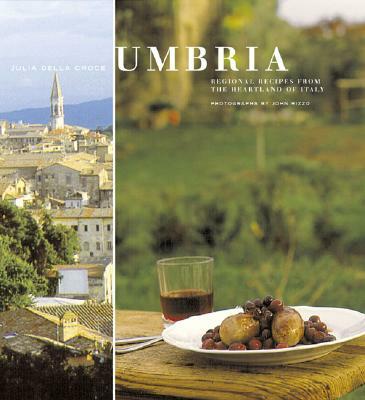 Her 56 recipes are spiced with photographs of the food, the countryside, the markets, and the people, with local lore and insider tips on the best Umbria has to offer. An invitation to the heartland of Italy, Umbria is a gourmet feast for the eyes and the palate. John Rizzo is a photographer whose work has appeared in magazines including Bon Appetit, Wine Spectator, Life, and Food & Wine."